Hibbing recently updated its comprehensive plan. Based on community feedback and technical research, the steering committee identified top priorities for the city. Photo courtesy of IRRR. Today the city is over 186 square miles with 16,230 residents. 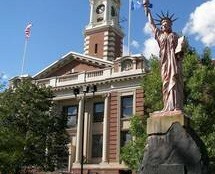 Hibbing is home to its own independent school district with four schools, a community college, an airport with daily flights to Minneapolis, an integrated health care system, 36 parks, and 43 nationally registered historic sites. Mining and health care are the top two industries and provide the majority of employment opportunities. However due to Hibbing’s central location, many of its residents are able to conveniently commute to Duluth, Grand Rapids and other cities in the region while still enjoying the town’s quality of life. Like other small towns in rural Minnesota, Hibbing recently updated its comprehensive plan to identify strategies for land use, economic development, housing, transportation, community facilities and recreation. The process was led by a professional planning firm that guided a steering committee of city officials and volunteer citizens. Input from the community was solicited through public visioning sessions, online engagement and a resident survey. “The survey garnered a lot of very helpful information, and common themes emerged,” said Hibbing City Councilor Jennifer Hoffman Saccoman, who served on the steering committee. She said it became very clear that the people of Hibbing are extremely interested in maintaining and advancing the city’s quality of life components such as housing, parks, recreation and access to natural resources. Based on community feedback and technical research, the steering committee identified top priorities for the city. Action steps to be taken in the near future include a major remodeling of the locker rooms at the Memorial Building multi-purpose indoor arena, construction of a new splash pad in Bennett Park, completion of the Hull Rust Mine View, and improvement of the affordable housing inventory for seniors and young families. Iron Range Resources and Rehabilitation assisted Hibbing with a grant through taxes paid by Minnesota’s mining industry. As part of the agency’s commitment to preparing communities for the future, it has since 2010 supported 47 northeastern Minnesota communities in completing or updating their comprehensive plans. Email Whitney Ridlon at whitney.ridlon@ state.mn.us or call her at 218-735-3004 for more information. Source: The Ranger, March 20, 2019. The Ranger is a publication of Iron Range Resources and Rehabilitation.